Shares of Devon Energy, Range Resources, and ExxonMobil look rather cheap right now. Here's why you may want to consider them for your portfolio. Sometimes the markets move in mysterious ways. One great example of this is the oil and gas market right now. Even though we have seen oil prices rise significantly over the past year or so, and they currently hover around $75 per barrel for Brent crude oil, the prices of many companies in this industry are still trading as though oil is $20 less than that. So we asked three of our investing contributors to each highlight a company they think has a compelling investment case right now in the oil and gas industry. Here's why they selected Devon Energy (NYSE:DVN), Range Resources (NYSE:RRC), and ExxonMobil (NYSE:XOM). Matt DiLallo (Devon Energy): Oil producer Devon Energy hasn't benefited from the uptick in oil prices this year. 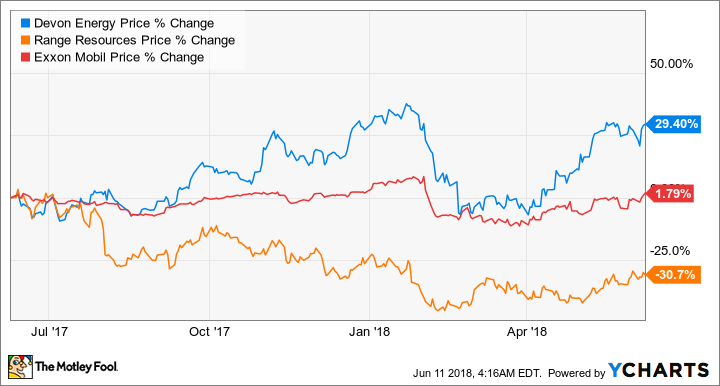 Overall, shares of the exploration and production (E&P) company have only increased about 2%, which has vastly underperformed the price of oil -- up 7% this year -- and the average E&P stock -- up nearly 14% as measured by the iShares US Oil and Gas E&P EFT. Because of that underperformance, Devon's stock trades at a bottom-of-the-barrel valuation compared to its peers. Devon is working to address that valuation disconnect by selling non-core assets and using the proceeds to repurchase shares. Earlier in the year, the company announced a $1 billion buyback program, which it recently boosted to $4 billion after agreeing to sell its midstream business. That repurchase program has the potential to retire 20% of Devon's outstanding stock at the current share price. That buyback could drive shares meaningfully higher in the coming year given what similar programs have done for rival E&P's. Last fall, for example, Anadarko Petroleum unveiled a $2.5 billion share repurchase program, which at the time was enough to buy back 10% of its outstanding shares. It has since increased its authorization by $500 million and is on pace to repurchase that entire amount by the end of the current quarter. This program has helped drive Anadarko's stock up nearly 60% since last fall -- vastly outperforming Devon Energy -- while the buybacks of other oil producers have also fueled big-time outperformance over the past year. Devon's buyback could prove to be a similar catalyst, making it one of the top oil stocks to buy this month in my opinion. Tyler Crowe (Range Resources): I'm typically loathed to recommend a company that is focused solely on exploration and production (Note from Matt: He is.). That is especially true of natural gas producers because the natural gas market is so constrained by the ability to move product to places outside the U.S. Even under these less than favorable market conditions, a stock can stick out as incredibly cheap. One stock that sticks out to me right now is Range Resources. Range's natural gas assets sit on some of the most prime acreage in the Marcellus shale gas formation. The economics of its wells are so good that even at today's benchmark prices of $2.89 per thousand cubic feet, the company is able to generate a decent rate of return. Today, the company's cash costs are around $2.00 per mcf, and that is with high transportation costs because of a lack of takeaway capacity in the region. Range is by no means perfect. The company's debt profile is a little high for comfort, and the company hasn't had the best reputation of living within its cash flow. However, there are a couple catalysts in the works that should help correct this. One is that Range is looking to sell its non-core acreage in Northern Louisiana that could be incredibly attractive for someone looking to export gas via LNG. The other is new pipelines in the Marcellus region which, according to Range, will reduce its cash costs by another $0.25 per mcf. It also helps that management is saying the right things about growing production within its cash flow. These three things should drastically improve returns and reduce its debt load. As it stands today, Range trades at less than its tangible book value. Range's prospects will wax and wane with the price of gas, but the plan management has in place should make it able to handle incredibly low gas prices and generate solid returns as pipeline access opens up. Reuben Gregg Brewer (ExxonMobil Corporation): Exxon's stock is down around 2% so far this year, while many of its peers are up 10% or more on a relatively strong oil market. 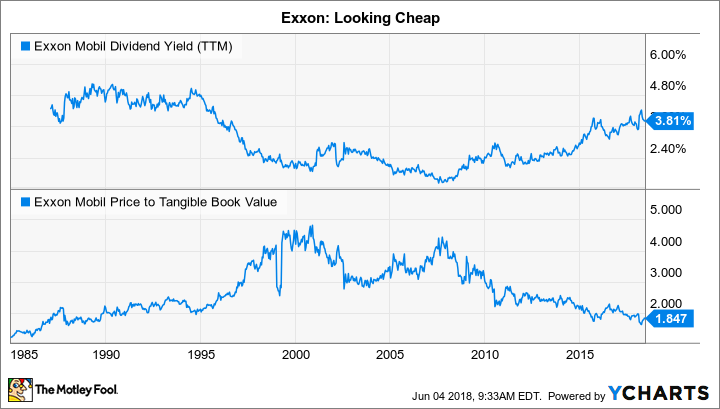 Some of the key reasons for Exxon's lagging performance are falling production numbers and a return on capital employed ratio that has fallen in line with the pack after years of above average results. It's been hard to love Exxon lately, but don't get too caught up on these short-term issues. Exxon has a number of large capital projects in the works that should get production growing again, including offshore drilling in Guyana and Brazil, liquefied natural gas in Mozambique, and production growth plans onshore in the United States. Meanwhile, management plans to take a leading role operating more of its major projects, an area of expertise for the company, which it believes will help push return on capital employed from the current single digit level up into the mid-teens. The problem is that it's going to take time to shift gears at this $340 billion market cap oil giant. But that's opened up an opportunity for conservative, long-term investors. The price drop being driven by investors thinking short term has pushed the yield up to roughly 4%, the high end of the stock's historical range. And its price to tangible book value is lower than it has been since the late 1980s. If you have faith that Exxon can return to its industry-leading ways, now is a good time to jump aboard.